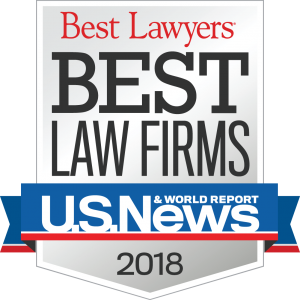 HOUSTON – Nov. 1, 2017 – Coats Rose, P.C., a business transaction and litigation law firm, has been recognized in the 2018 “Best Law Firms” survey by U.S. News & World Report and Best Lawyers® for Tier 1 national and Tier 1 metropolitan rankings across its offices in Houston, Austin, San Antonio and New Orleans. The firm was recognized nationally as a Tier 1 firm for construction law and construction litigation, and Tier 2 for real estate. Firms included in the 2018 Best Law Firms list are recognized for professional excellence with persistently impressive ratings from clients and peers. Achieving a ranking shows a unique combination of quality law practice and breadth of legal expertise.